When specific institutional exceptions entered into the Copyright Act in 1997, the ensuing challenge was to decode an array of conditions, spread over the distinctions between Educational Institutions, Libraries, Archives and Museums, the kinds of machines installed in these institutions, and such permutations and combinations thereof. The effort to determine where legitimate copying began or ended was not for the faint of heart. Receiving Royal Assent in the Second Session of the 35th Parliament 1996-1997 (through a bill named C-32), the exception for libraries concerning interlibrary loan (ILL) was less than generous. It was restricted by genre to scientific, technical or scholarly works — fiction or poetry was strictly disallowed — with newspapers only eligible if more than a year old, and restricted by purpose to only research or private study. It also mandated that copies could not be in digital form. The construction of the exception was intended to facilitate productive unauthorized uses of copyrighted material, but then was called upon to placate copyright owners who opposed exceptions of any kind. At the time, economist Michael Rushton observed that “[the exceptions] were heavily amended at committee stage, generally in favour of creators’ groups (p. 327). using the digital copy for more than five days following first access. Taking “measures” allows for some elasticity in application, libraries are shielded to a degree from adopting onerous surveillance practices. But it should be evident that this style of exception is woefully inadequate to the reality of past and current information flows. A routine need is the sharing of materials among a group. This can take form in a myriad of ways: students working on a group project, researchers or writers collaborating from near and far, professional societies responding to regulatory developments, or civil servants addressing media coverage, just to name a few. Yet under Section 30, each member of a group must submit a request for necessary material, which the supplying library will fill, many times over. And this presupposes that all sources of material are known in advance and that serendipity has no role to play. While the caveat of Section 30 is inefficient and illogical, disregarding a section of any Act leaves a feeling of unease. Fortunately, libraries need not follow Section 30 piecemeal; instead, libraries are able to rely upon the entirety of fair dealing instead. Section 29 is concise: “Fair dealing for the purpose of research, private study, education, parody or satire does not infringe copyright.” There are no further restrictions upon the purpose, no restrictions upon genre and (as CCH Canadian taught us eleven years ago) no restrictions regarding commerciality (para. 51). Of course, the unwritten rule since CCH Canadian is that the proposed copying must be evaluated for fairness, via a framework of context-appropriate factors. Consider the following: A person submits an ILL request and further distributes the material to a group. If all involved in that group are each entitled to make that ILL request, it is difficult to see how a single request on behalf of a group of entitled individuals could be construed as unfair. If anything, that single request should be lauded as it eliminates duplication of effort for both lending and receiving libraries. The fairness analysis then shifts largely to due care when proceeding with the group distribution. Meaning, posting the material to a publicly available website would be frowned upon. Instead, a secure server comes to mind. A library might make that suggestion if it so wishes. Regardless though, CCH Canadian also made it plain that libraries are not responsible for the actions of their members (para. 45). As an integral part of the scheme of copyright law, the Section 29 fair dealing exception is always available. Simply put, a library can always attempt to prove that its dealings with a copyrighted work are fair under s. 29 of the Copyright Act. It is only if a library were unable to make out the fair dealing exception under s. 29 that it would need to turn to s. 30.2 of the Copyright Act to prove that it qualified for the library exemption (para 49). The book is not a history, nor an official report of results accomplished; but, as far as I have been able to make it, a human-interest story of what books and reading have meant to the morale of the army and to the individual soldier and sailor in helping them to win the war and preparing them for their return to civil life (p. viii). So wrote Theodore Wesley Koch (1871-1941), scholar and librarian (last featured here), in Books in the War – the Romance of Library War Service. Posted to London in 1917 by the Librarian of Congress, Koch became aware of British efforts to supply their soldiers with books, “in camp, trench and hospital.” By the time Koch returned, the United States had entered the war and Koch was asked to assist in the promotion of Library War Service. His chronicle of the war years was published in 1919; sadly, only a few printed copies remain in circulation. But thanks to the provision of original books from Harvard University, University of California and University of Wisconsin, digital replicas are available for the benefit of all via Internet Archive and HathiTrust Digital Library. The initiative to provide books to the fighting forces, apparently brought out the best in people. The preliminary appeal for funding had been via private subscriptions – a one million dollar goal was quickly exceeded with nearly $2 million raised. Publishing houses joined the effort: “… discounts of from forty-five to fifty percent were not uncommon (p.10).” And some university presses and correspondence schools donated generously from their own inventories. If there was any doubt of the value of books to soldiers, it was dispelled immediately following the launch of the libraries. Established at training bases, front line units, hospitals, convalescent homes and prisoner-of-war camps, and staffed by librarians (many of whom were volunteers), the libraries were much needed and much loved. Drawing upon original letters, reports and conversations, Koch meticulously described the impact made by the availability of reading material. His research was extensive. 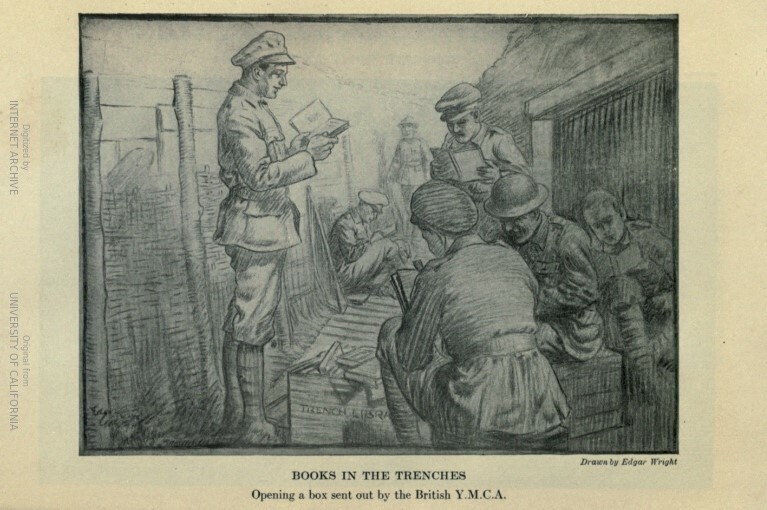 British sources included details of library programs for colonial troops and Koch gave the full extent of the reach of library books in World War I. ‘Please send us some books. We ain’t got no books at all. We are regulars and get just as lonesome as national guards.’ This was the appeal sent by a private from a small camp to a public librarian in the East. Into the first of several shipments the thoughtful-librarian slipped a supply of candy and tobacco. The response was immediate. ‘If you ever done good to a man you done good to me,’ wrote the soldier, ‘but please don’t waste no more space for eats. Just send the books.’ (p.23). [He] asked for books which would explain the psychology of camouflage. He was something of an artist and had been successful with colour photography. … Material was found for him and he succeeded in hiding guns so well with paint that he deceived his own captain (p.31). But beyond technical matters, also desired were books of poetry, literature, biography, mathematics treatises, and, maps and histories of the regions where soldiers were posted. Newspapers and magazines were no less appreciated by men far removed in space and time from life back home. And, given the diversity of cultures among the soldiers, materials were needed in Arabic, French, Greek, Hebrew, Italian, Russian, Spanish and Yiddish, just to name a few of the languages spoken. It is no exaggeration to say that most soldiers emerged from World War I more well-read or better educated than when they entered. An interesting educational experiment was carried on at Witley Camp, occupied by some of the Canadian forces in England. There the library hut of the Y.M.C.A. and the three adjacent huts were handed over by the authorities for educational purposes and became the pioneer college of the “Canadian Khaki University.” .. Credits were given for work properly done in English, French, the classics, mathematics, and agriculture. .. Examinations were held and certificates given, and men were helped to complete an interrupted academic course and to prepare themselves for satisfactory positions after the war (p.55). World War I is not known to stand out on the historical stage for its humanity; but that some was found courtesy of librarians and books should not altogether surprise us. Koch’s work is exemplary and its digital existence, replete with all the original images, help with the quest, lest we forget. Charles Dickens is with us at this time of year, his own ghostly visitation appearing via A Christmas Carol. But his spirit may have been addedly engaged last week when the news broke that scholars at Heinrich Heine University in Dusseldorf had ranked the Vancouver Public Library (together with Montreal’s Bibliotheque) as the world’s best public library. This evaluation of libraries came through focus upon “informational cities,” defined as “prototypical spaces of the knowledge society … where flows of information, capital, and power are as or more important than physical spaces (p.1).” Even more critical than the ranking, although as a Vancouverite I would not wish to renounce it entirely, the analysis makes plain that libraries form “an essential part of the city’s … knowledge and creative infrastructure… (p.313).” It is this sentiment that furthered the establishment of public libraries in England in the 19th century. They assembled to establish no Charity School, with a scrannel supply of innutritive knowledge for the workers, but a great and enduring institution filled with the light of genius from every age and every land, where the gifted sons of poverty may burst from their bonds … for the advancement of civilisation and the highest interests of the human race. … Without exception, the working of all the free libraries so established and brought into active operation has proved eminently satisfactory to all classes of ratepayers. It has largely promoted that industrial education which fits men for their specific callings in life, as well as that wider education that reaches farther and higher…. (p.16). History must always remain incomplete, but last week’s news gives hope that libraries may yet endure as “wise and modest” institutions facilitating harmony as much as knowledge. * Charles Dickens, “Opening of the Free Library, Manchester.” The Speeches of Charles Dickens, ed. K.J. Fielding (Oxford: Clarendon Press, 1960) p.151-154. Note: The text varies slightly from the archived speech presented by the NY Times. A week has passed since our Supreme Court issued five decisions concerning copyright in the analog and digital age. The commentary is fascinating; see Howard Knopf here, Bob Tarentino here, and ongoing, detailed coverage from Michael Geist here. In his posting today, Geist emphasizes that the long-term prospects for Canada are very good: (i) The language of user rights is not merely a conceptual term; it is a robust principle which will affect all future examinations of copyright. (ii) The Copyright Act must be read as technologically neutral; developments in technology cannot be assumed as sufficient reason to extract added licensing fees from people. (iii) Fair dealing is positioned for continued growth via the Court’s support of the “large and liberal interpretation” first enunciated in CCH Canadian. To which I would add one more note of satisfaction. In Alberta (Education) v. Canadian Copyright Licensing Agency (Access Copyright), the Supreme Court reminded Canadians that libraries were places where students and teachers may access and copy work germane to the pursuit of education. It borders on the absurd that we should need such a reminder but, as I wrote a year ago, AUCC’s copyright and fair dealing policies include an edict that material placed on reserve should not serve as a substitute for purchased copies. To which my question was, “What is the purpose then of library reserves, or indeed libraries in general? It seems to me to be axiomatic that most students lack the expertise to find or request the materials required for their own research and private study, and rely on the guidance of their teachers. They study what they are told to study, and the teacher’s purpose in providing copies is to enable the students to have the material they need for the purpose of studying. The teacher/copier therefore shares a symbiotic purpose with the student/user who is engaging in research or private study. Instruction and research/private study are, in the school context, tautological (para.23). By requiring that the conduct of copier and end-recipient be examined together, this Court is ensuring that fair dealing be as malleable as possible to address situations as of yet unknown. Again, it must be emphasized that the Court was examining the copying of excerpts of additional material used by teachers. Fair dealing is not license to copy entire textbooks for an ulterior motive of profitable mass distribution, and in no way can this decision be read as such. But it ought to be clear to AUCC, and the post-secondary community at large, that libraries should be allowed to function as per their central purpose — to facilitate widespread access to legitimately acquired material. Collective licensing is as deserving of a place in modern markets as any other business model, but our current situation is troubling. Access Copyright describes its purpose as “to protect the value of intellectual property” owned by authors and publishers, “by ensuring fair compensation when their works are copied.” Value is an interesting concept – value can increase by market-demand. Value can also be artificially elevated by restricting the supply. What concerns me is that Access Copyright is able to control both axes. And that leads to one plaguing question: How did we get into this mess? The situation now is almost surreal. How did a single organization manage to monopolize both their supply chain (the authors and publishers who produce the works) and an entire market (the educational community of English Canada)? * I decided to look for an answer to this question. Understanding how we arrived at this moment doesn’t make the situation better, but there’s comfort in knowledge. These were my opening remarks from a panel discussion “Out of the Shadows” hosted by the BC Library Association on November 2, 2011. Fellow panelists were Paul Jones (CAUT) and Dan Burnett (Owen Bird Law Corporation). We addressed a variety of issues affecting the post-secondary community including Access Copyright licenses (or lack thereof), Bill C11 (previously Bill C32) and the political atmosphere. The answer to my question lies in the pre-history of Access Copyright and the years that followed. Aiding my understanding were the works of Martin Friedland, Howard Knopf and Margaret Ann Wilkinson. Material was also drawn from the current annual reports of the Copyright Board of Canada and Access Copyright. My notes are available here. It was a very enjoyable evening; my thanks to the BCLA for inviting me to participate. * The province of Quebec operates with a different collective, Copibec, and relations there seem to be less contentious. The first textbook I bought for my university studies was Calculus with Analytic Geometry, by Howard Campbell and Paul Dierker, or C&D as students dubbed it. It was an 800+ page tome priced at $48. At the time I thought this was outrageous; an unbelievable demand of cash from first-year mathematics students. Later, as I confronted slimmer, yet more expensive books, I developed an affection for C&D. Serving as it did for three consecutive courses, it became the most economical purchase of my undergraduate studies. But not everyone bought their books. There were many for whom it was simply not viable. Years later a friend told me that during her first winter in Canada, a stark choice presented itself: buy boots or buy a textbook. She opted for the boots and managed her coursework by going to the library frequently and reading a copy available from the reserves. She was by no means the only one to do so, but the limiting of borrowing time mandated by the library effectively ensured access for everyone in need. As Michael Geist reported this week, the University of Calgary, Queen’s University and the University of Waterloo all signaled their intent to move away from collective bundled licensing of copyrighted material. Allied to this movement, post-secondary institutions are becoming more aware of fair dealing. However, as I wrote before, the leading institutional policy on fair dealing, by the Association of Universities and Colleges of Canada (AUCC), sets a very narrow interpretation of fair dealing. Their apologetic tone could have the undesirable effect of establishing practices that undermine the discriminating power of fair dealing. Only time can tell; much will depend on how faculty members respond. But an even more deleterious policy is finding voice through these measures — students cannot rely on library reserves for their required course reading. The AUCC fair dealing policy explicitly addresses what material can be borrowed. In Section III University Library Reserves, instructions are given toward the creation of paper or electronic copies of course material. It is AUCC’s directive that only optional reading material should be included in reserves; “no more than 25% of the required reading.” Of any material (required or optional) up to three copies can be deposited in reserves, allocated on the ratio of one copy per 30 students. (16c) The use of library reserve must not substitute for the purchase of books, coursepacks, or other published materials. What is the purpose then of library reserves, or indeed libraries in general? This same language has made its way to Queen’s University; see Schedule B, Fair Dealing Copying Guidelines – Interlibrary Loan, Library Reserve and Document Delivery of Copyright At Queen’s Policy. In many respects Queen’s copyright policies are laudable, but that the university supports limiting reserves in this way is disappointing. Moreover, following AUCC in situating the restriction as allied to fair dealing is disturbing. Fair dealing may arise from a use of material, borrowed or otherwise; fair dealing is not the filter by which to limit access to the material. If post-secondary institutions insist that course materials cannot be borrowed, that is their prerogative. But to represent that policy as related to fair dealing only further undermines fair dealing in the eyes of the very constituent body that can most significantly benefit from it: the post-secondary community.